Swimming is excellent cross training. My hips have been really tight this week, and getting in the pool felt so good to loosen everything up. The last time I swam laps was almost a year ago to the day! 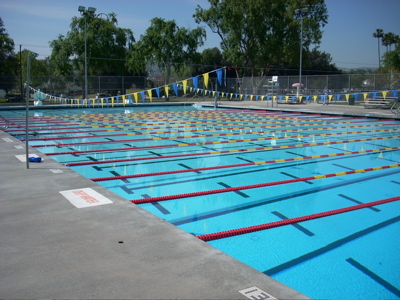 Today, I swam about 60 laps. I guess 64 is a mile, so it was pretty close! I felt like Jello at the end. It was a great workout. Wanna know who won the Kraft Philadelphia Cooking Crème Contest? Only eight entries? You can’t win if you don’t play! Maybe I should have told you that I’m also throwing in a Trader Joe’s treat. Congratulations to Tara and Erika. Send me your address (kelocity at gmail dot com). Tonight, I went out to a bar with some friends after work. Instead of alcohol, I got a seltzer/cranberry (two please!) And I passed on all the yummy (but incredibly greasy) appetizers. Part of me was sad because those deep fried cheese balls looked gooooood! But I also felt empowered. I am the girl with absolutely no will power. And tonight was victorious. I told my friends that I couldn’t indulge because I was going for a run after! And once I had in my head that I was going, there were no excuses and no battles in my head. I was going running tonight. And that was that. The other night, Irving and I almost got run over by a seemingly drunk driver. So tonight, we exercised caution and prepared for a nighttime jog. Don’t be jealous of my super reflective crossing guard running vest! Florecent Yellow and pink is MY color, yes? I also sported the blinking light arm band. Oh yes! Irving and I did a slow 3-mile jog, it was fun to catch up, and keep my promise to myself to run. SUCCESS! Today, I spent eight hours hanging out with Jillian Michaels, Alison Sweeney and a whole bunch of past contestants from the show. They were filming the season 10 premiere (which will air in September). It was a lot (A LOT) of waiting around, but it was worth it to see the past contestants (they look great!) They are like celebrities! So much fun! We arrived at 7am (because only the first 300 people got to work out with Jillian). I was so glad to have my friend Stephanie there too! While we were in line, they handed out Larabars and fruit for everyone. First up, we met Amy and Philip! Then Jillian and Alison Sweeney took the stage and we did a mini bootcamp with Jillian (pushups, jumping jacks, squat jumps and mountain climbers). But part of the challenge involved aerobic step-ups. I did about 600 stepups during the filming. woo hoo! Then the winners took off in a limo to head to the ranch! It was a very LONG day, and it was very cold down near the ocean, but it was really fun. I can’t wait to see how it all comes together in September. And don’t forget that the Season 9 finale is Tuesday night! Thanks to my friend Stephanie for letting me use some of her pictures!!!! Comments Off on Biggest Loser Season 10 Taping! Today, I had some pretty greasy fries with my lunch. Someone actually walked by and asked if I went to McDonalds because you could smell the oil in the air. While they tasted good at the time, I swear, I had grease coming out my pores by the end of the day. Ew, right? So after work, all I wanted to do was sweat. I headed out for a run… but it turned out to be a 2 mile walk. But when I got back, I dusted off my weights and did one of my favorite moves that my trainer taught me last year. I call it The Power Pyramid! 7 pushups, 7 bicep curls, 7 shoulder presses <—–The Top of the Pyramid! I really should start doing this every day to tone up a little bit. Plus, it’s fun to make karate moves using your camera’s self timer. Yes? Do you have any quick, easy and powerful moves? Do share!